On this page we will share with you some pink white and charcoal grey nursery ideas for a baby girl that includes the pros and cons of using a dark paint color on the walls of the the room. Most DIY decorators will agree that there are projects, nursery and otherwise, where using a deep, rich color on the walls adds drama and atmosphere. In a different setting, the same choice simply serves to create a space that is closed in and claustrophobic. I suppose you are wondering by now, when can I paint using a dark color? We have many pictures featuring pink white and charcoal grey nursery ideas including baby bedding and decor. Go here to see how to get the look for less! The blue-grey paint that was used in this baby girl nursery design is part of the Benjamin Moore product line called Anchor gray 2136-30. Similar shades with slightly different undertones include Dior Gray (also from Benjamin Moore) and Valspar's Elephant Gray. The wooden trim is painted with Benjamin Moore's Cloud White, cc 40. The reason that a dark wall color works well in this project is due to the ample size of the space, the nine foot ceiling height and the use of white and pastel window treatments and decor for contrast. The wide pink and white stripes of the curtain panels and blinds add a bright touch and bring light to the atmosphere of the room. Notice the beautifully pleated edging of the window valance in salmon pink and the elegant drape of the fabric. The stuffed dolls on the grey and white ottoman are Mizy Me dolls and the pink, stuffed elephant is from Pottery Barn Kids. The chandelier is a vintage find in white painted metal with teardrop crystals. The fixture was rewired and embellished with new crystals. Tip: Shopping secondhand stores for lighting that can be painted and re-wired is a great way to add personality to your project and to save money! 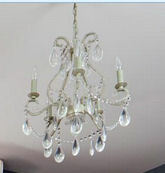 A similar chandelier can currently be purchased for less than $100. The pink and white paper butterfly ceiling mobile is, same as the adorable elephant, from Pottery Barn Kids. One of the best of teh pink white and charcoal grey nursery ideas that we have that will save money while getting the look of this room is that you can easily make your own with very little time and money invested. All you will need is a butterfly paper punch, a metal hoop, paper and some ribbons to use as a hanger for your creation. Similar versions are for sale on Etsy if you are not into crafts and/or PBK no longer offers it. The white crib used in this project came from MHC Furniture and is available in a wide variety of colors. However, for this project, white was the best choice. The area rug is a pink wool needlepoint with a trellis pattern in white that was made using yard goods. Tip: Visit your local carpet store and ask them to custom make an area rug to fit your baby's nursery. The ottoman is upholstered in grey scripted cotton. you should be able to find something similar at a fabric store. Go here to see an ottoman upholstered in dark grey fabric with script writing in light grey or white. Unique Baby Gear Ideas appreciates the opportunity to share this beautiful nursery decorating project and our pink white and charcoal grey nursery ideas with our visitors. We hope that our tips will help to make DIY decorators' job easier and perhaps save some money along the way.